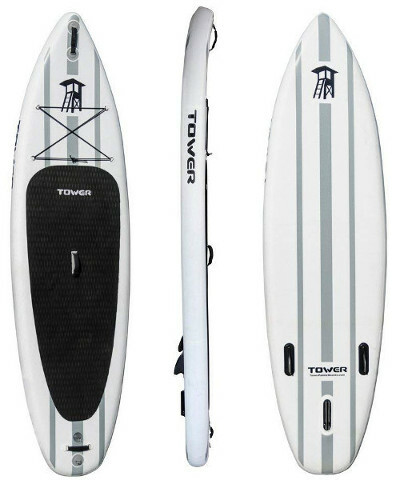 Tower is easily one of the pioneers in the industry of inflatable paddle boards as it is a brand that has revolutionized the notion of iSUPs and gained more trust faster than any of its competitors. Indeed, the trademark of Tower is quality and that has been its motto since the beginning where Tower was but a little name with a big dream. 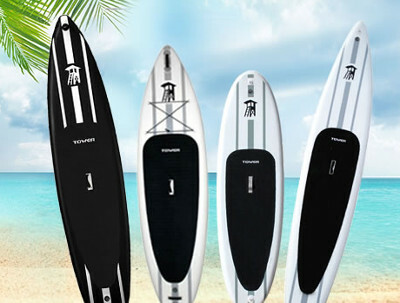 In that respect, Tower Paddle Boards has managed to grow exponentially in the late couple of years and amass an astounding fan base due to its reliable, versatile and quality boards. 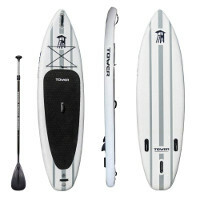 However, when digging around in its inventory, you’ll be faced with one too many choices and that can get confusion which is why we selected the top 4 inflatable paddle boards in the history of Tower Paddle Boards. To put it simply, the Adventurer 1 is that guiding companion that you’ll always have along your side in the beginning of every video game which will help you discover the ropes and swings in a safe and stable environment. 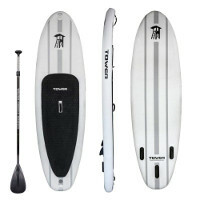 Indeed, Tower Adventurer 1 has been the number one board for beginning paddlers because it has so much to offer. In that respect, the board at hand measures a holistic 9 feet 10 inches in length, which is the universal measurement for standard boards that are compatible with paddlers of all sizes. Further, the board at hand is in the lead of entry-level boards because it measures 32 inches in width, which equates to absolute stability and beginner friendliness. On the last dimension, Tower always goes with the same standard 6 inches in thickness to give the board more buoyancy and in this case enabling the adventurer to carry a load of 350 pounds. Since the beginning of this review, we’ve been stressing the fact that this is one of the best entry level board on the market and that has a lot to do with how it performs. In fact, the Tower Adventurer 1 is actually quite impressive for a beginner board as it is smooth and satisfyingly authentic. Also, the board features wide tail and nose for extra stability and three fins for a steady less agitated command. In the end, what every paddle board needs to be considered as an option is the packaging because it truly makes a whole lot of difference. Especially for beginners, Tower makes sure that it hooks all its boards with all the accessories you’ll need to maintain them but sadly, the Adventurer is missing a much appreciated carry bag. The Adventurer 2 is the bigger more aggressive sibling of the Adventurer 1. This board is indeed a completely different iSUP with a special profile. There isn’t much of a difference in the build of the board however as the Adventurer 2 is also made out of the same military grade PVC and features the same exact accessories but it is so very different when it comes to performance. Before we go into detail on performance, let us take a moment to understand where the Adventurer 2 stands out and where it doesn’t. first things first, being more aggressive made the Adventurer 2 a little bigger and at 10 feet 4 inches in length, it is already targeting a more mature paddlers. Further, the board willingly respect the 32 inches in width rule that Tower works by because we don’t change what works and because you can’t get better stability with similar agility. Lastly, the Adventurer 2 remains true to its values via the 6 inches thick hull that leaves no room for weak links and soft spots. PS: The board is capable of handling up to 350 as a maximum load. Down to the practical part, the Adventurer 2 is clearly an upgrade in so many ways from ts more docile entry-level sibling. Indeed, the board at hand is considered to be an enthusiast’s pick and that already tells you a little about what to expect from it. Hence, the Adventurer 2 makes it clear that it is going to be meaner and quicker to response due to its sharper nose while the lifting in the front will significantly reduce resistance and grant it even more agility. Speaking of which, this Tower is sitting on a solid navigation system that will enable you to track nicely and manoeuver even better. 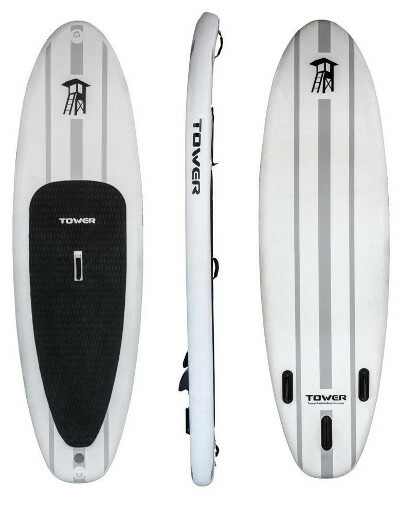 To wrap things up, Tower always creates a clear distinction between its boards and the rest because they truly are reputable quality boards but sometimes the distinction isn’t always to the paddler’s favor. Undeniably, the board comes within a somewhat complete package but there is no backpack included which takes away a little chip of how great this board really is. And from the raging entry level board scene, Tower makes a huge leap to the touring scene which is a far more precise niche with a lot more precise requirements. Hence, how good of a touring board can a relentless brand like Tower create? Let’s find out. There is already so much to say about this board because it is undeniably splendid. 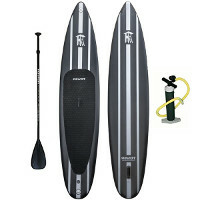 Indeed, the Tower Xplorer can easily be described as gigantic SUP which isn’t always a positive for inflatable paddle board. 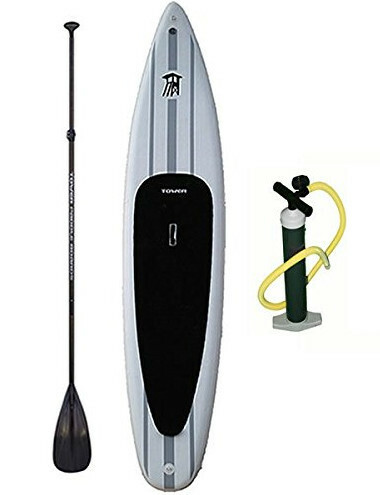 Undeniably, larger paddle boards are harder to handle, store and transport but since this is an inflatable, it already takes away so much negativity and turns it into positive. 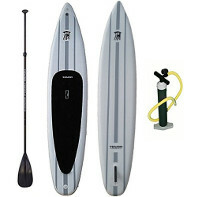 So, what makes the Xplorer a reliable racing SUP board? Well, for starters, the board measures a dazzling 14 feet in length which is twice as long as the longest human being you’ve ever met and that makes it solid for long steady journeys in deep water, lakes and calm rivers. Moreover, the board wouldn’t be so complete without enough width to balance itself out which is why Tower went once again for the standard 32 inches to create a stable environment which will be much needed on longer rides. 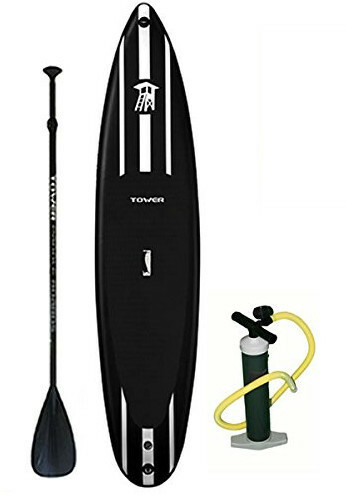 Lastly, the board at hand is no exception to Tower paddle boards unless for thickness as it goes for an unprecedented 8 inches that makes this inflatable paddle board capable of handling a ton of weight. PS: The board can carry a maximum load of 700 pounds. As far as performance is concerned, you can already connect the dots based on the board’s dimensions to learn that this is easily one of the most stable, robust and practical floating objects out there. Indeed, the Xplorer is not only tough, it’s also surprisingly responsive for a big board. In fact, the board is supported via its thinner ends and single fin navigation system to be as agile and responsive to command as possible. There is so much more to say about the Xplorer but to wrap things up, there is one more thing to tackle and that is packaging. Packaging is undeniably very important for inflatable paddle boards specifically because they need a specific set of tools and accessories to be maintained and the Xplorer comes with the basics, leaving a much needed carry bag behind. The Tower iRace is literally the black goat in its family and it’s not only because it comes in a different colour but also because it looks like the cooler much more sophisticated cousin that only visits once in a while to steal all the attention and run away. Indeed, there hasn’t been a more attractive racing boarding in Tower’s catalog since the creation of the iRace and that is already impacting the brand’s policies. Undeniably, the iRace is a solid racing board because it is technologically advanced but most importantly because it measures 12 feet and 6 inches in length. The length of the board is significant because it impacts performance directly and if you’re considered to be an adult by any standard then the iRace will be the right fit for you. For a racing board, this Tower comes at 30 inches in width in order to enhance agility and responsiveness on the account of stability, which makes this Tower the bf or gf that will always break your heart but you’ll always want more. As far as thickness goes, the iRace stays true to the 6 inches standard, which grants it allows it to handle up to 350 pounds. In terms of performance, you can already tell where this is going just by looking at the iRace. Indeed, the board at hand is simply designed to be fierce, to endure anything from waves to white wash and to cut through water like a fish and that is supported via a lifting sharp nose, a slim and slender hull, smooth edges and an exceptional navigation system which is perfect for speed, manouever and straight tracking. Just like all the other Tower boards on this list, the iRace is actually no different when it comes to packaging because it seems that Tower has reached a conscientious that paddlers only need a high pressure hand pump and a paddle to enjoy their paddle boards. So, as long as you can find yourself a proper carry bag, you should be definitely happy with this and every other Tower on this list.